← Today’s Watercolor: A New Facebook Page! Today’s Art: What’s Beethoven’s Favorite Fruit? It’s DAY TWO of my week of posting every day in celebration of my new Facebook page. Today’s a little pen and ink based on one of my favorite Oyaji gags. This one is really tough for Japanese people, because in Japanese Beethoven’s fifth goes “Ja-ja-ja-jaaaaaa” instead of “Na-na-na-naaaaa” and it breaks their brains to think of it any other way. Like my Two Tired Bicycle, this is obviously inspired by the amazing Frida Clements. She hasn’t done this joke yet, though, that I know! This entry was posted in Art and tagged Art, bad joke, banana, beethoven, copic, dad joke, funny, illustration, joke, my art, oyaji gag, pen and ink, silly. Bookmark the permalink. 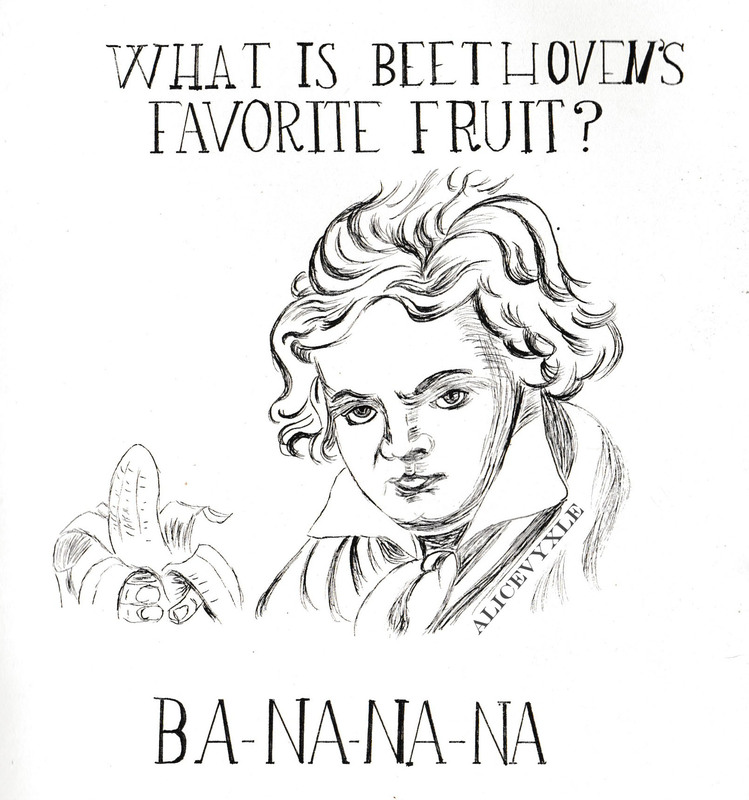 1 Response to Today’s Art: What’s Beethoven’s Favorite Fruit?